A Clinton Foundation official pressed Hillary Clinton's top aide Huma Abedin to give special State Department access to a major donor who was accused of laundering money from Nigeria, according to emails released on Tuesday. 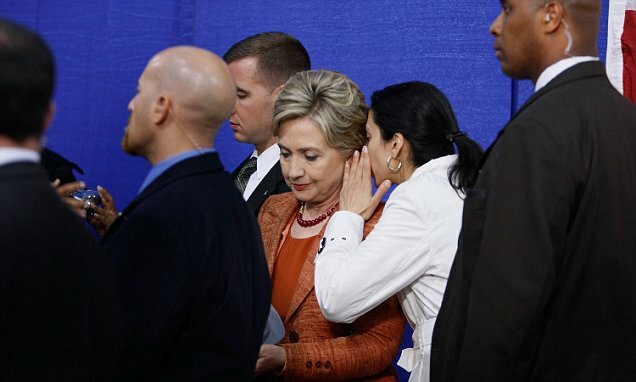 Doug Band, a top official at the Clinton Foundation, emailed Hillary Clinton aide Huma Abedin in April 2009 and asked her to connect Gilbert Chagoury, a billionaire Lebanese businessman who pledged $1 billion to the Clinton Global Initiative, with the U.S. Ambassador to Lebanon Jeffrey Feltman. Chagoury, a former confidante of brutal Nigerian dictator Sani Abacha, was convicted in 2000 of laundering Nigerian money to Switzerland in connection with the Abacha regime. Under a plea deal, he agreed to pay Nigeria $66 million, and the Swiss government later expunged his conviction. According to U.S. diplomatic cables published by Wikileaks, Chagoury has also been a key financial backer of pro-Hezbollah Lebanese politician Michel Aoun. At the time of Band's request to connect Chagoury with the U.S. Ambassador to Lebanon, Aoun was running for parliament in Lebanon on the Hezbollah-aligned bloc. In 2010, it was discovered that Chagoury had been added to the U.S. No-Fly terror list and barred from boarding a private jet in New Jersey. He was able to obtain a 'waiver' to fly, and was later removed from the list and received a written apology from the U.S. government. With Hillary the corruption is endless and for some reason people who cross her die. Just look at Seth Rich who has now been identified as the person who leaked the DNC emails to Wikileaks. Hillary is pure evil. Why is Hillary never prosecuted for crimes that everyone else would be? We are way past the point where it should be a surprise that Hillary can break any law, including those related to murder and still be running for president. Hillary Clinton would make any mafia boss envious. She could write a book for other crime families on how to get away with murder and corruption on a global scale. And the Italians thought they were good a mafia crime, they are not even in the same ball park with this old woman. This just more of the same corruption we have seen from Hillary her entire career. How can open bribery not be illegal. What is wrong with the media? What is wrong with the government? How can she break every law with no repercussions? We might have once looked to the FBI or the DOJ, but not anymore. They are just part of the mafia network running our lives. The corporate media, the government and all their agencies will do whatever it takes to hold onto power. They will never stop one of their own, no matter what crimes are committed, murder included. The director of the FBI, Comey, actually said that the "common people" would be prosecuted for doing what Hilary did, but that they were not going to prosecute her. There it is, out there for all to see. The corporate media will do anything to cover for Hillary. Just yesterday they picked a sentence out of Mr. Trump's speech, given to 10,000 people, and started accusing him of inciting violence. The media is disgusting in their complicity with Hillary. Everyday they pick some tiny issue with Mr. Trump and blast it all over the networks, leaving the real issue of Hillary's actual law breaking cover in the dust. It is Mr. Trump and the American People against the world. If we lose this one, we have lost it all. Is there anything that Hillary could do that would result in law enforcement stopping her? Hillary is all about the money and the power, nothing else matters. Strange that our only hope is in Julian Assange and Wikileaks. This is must unbelievable. How does this happen? Yet, it seems to be happening all over the world. In a the real world, not only would Hillary be prosecuted, but the media and the government would be prosecuted as well as willing accomplices. The billions of dollars the corporate media has they could easily do what Wikileaks is doing, but instead they choose to cover up for Hillary and friends. It is just part of the graft and corruption that is endemic in the US government.